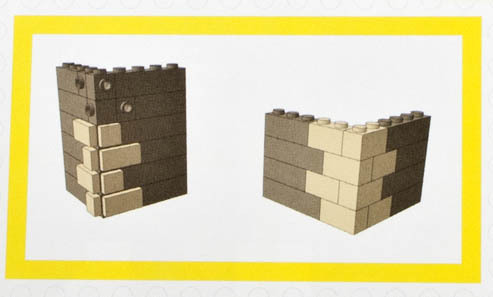 The book uses two minifigures, named after the authors, to take the reader on a lesson about creating LEGO buildings. The book is fairly small at 21x21cm but packs 200 pages. It is not a hardback cover, more like a thick card, but has some nice glued binding. Keeping the book open was easy, and didn't feel like it was going to rip apart. The first 80 pages contains a lot of great detail and example building components. The rest of the book contains building instructions for a Corner Drugstore, as well as three houses which are based on a common structure with different facades. All of these buildings are featured on the cover of the book. It starts out describing the standard for connecting Modular Buildings, and techniques for interconnecting buildings and floors. It then guides you through choosing a color scheme, and a bit about architectural choices. 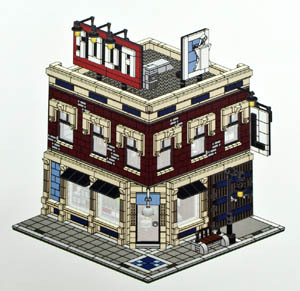 It contains some great examples of translating real life architectural features into LEGO designs. The next chapter contains plenty of examples for various external decorative elements - lights, columns, windows, plants, benches etc. It also includes building instructions for a few of them: a park bench, traffic lights and a street light. 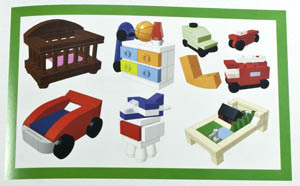 The following chapter contains images of sample buildings that the authors created, including some mini modulars. I believe they all appear on their website Brick City Depot. The last instructions are for three different types of houses. These all use the same basic building structure with two full size stories and a smaller attic roof. The front of the building is covered with SNOT studs to cater for the three different exteriors. It's a pretty clever concept, great for experimenting with different facades (and fitting instructions for four houses in one book!). Overall, I found it to be a well thought out and designed book. The content is great for anyone interested in creating LEGO buildings, and has lots of material for inspiration. The book is available from September for $19.95. You can pre-order from No Starch Press or Amazon (currently $14.27).